The invention provides a generalized predicative control method of a high-speed train based on an adaptive network-based fuzzy inference system (ANFIS) model. The method utilizes a data-driven modeling method to build the ANFIS model in a running process of the high-speed train according to acquired high-speed train running data; adopts subtractive clustering to determine rule number and initial parameters of a fuzzy model, and adopts a back-propagation algorithm and a least square method to optimize parameters of the fuzzy model. The predictive tracking control method of electric multiple unit running speed on the basis of the ANFIS model obtains accurate controlled quantity through multistep predication and circular rolling so as to change blindness of adjustment by experience, enables the high-speed train running speed to track a target curve accurately, solves the problem of large lag, achieves on-schedule, safe and effective running of the train, and guarantees safety of passengers. The method is simple, practical, capable of achieving automatic drive control of the high-speed train and suitable for on-line monitoring and automatic control of a running process of the high-speed train. 本发明涉及高速列车运行过程建模与速度预测跟踪控制方法，属高速列车运行过程监测与自动控制技术领域。  The present invention relates to a high-speed train operation process modeling and speed prediction tracking control method, is monitoring and automatic control technology for high-speed train operation procedure. 背景技术· 随着社会的快速发展，运输量不断增加，为加强现代综合运输体系的建设，根据《国民经济和社会发展第十二个五年规划纲要》，我国需大力发展高速铁路，基本建成国家快速铁路网。 BACKGROUND ·  With the rapid development of society, traffic continues to increase, to strengthen the construction of a modern integrated transport system, according to the "National Economic and Social Development Twelfth Five-Year Plan", China needs to develop high-speed rail , basically completed the country's rapid rail network. 闻速列车是闻速铁路技术体系的核心，是国家相关闻技术发展水平、相关制造能力、自主创新能力以及国家核心竞争力的综合体现，对于具有高速度、高密度运营特性的高速铁路来说，高速列车运行安全是重中之重，然而高速列车作为一个由复杂技术装备组成、在复杂环境中运行、完成具有复杂时空分布特征的位移服务的非线性动力学系统，如何对高速列车运行过程建立有效的模型和实施速度跟踪控制，对确保高速列车安全、平稳运行尤为关键。 Wen-speed train is the core of smell-speed technology system of the railway, is a comprehensive reflection of the relevant state of the art, related manufacturing capability of independent innovation capability and core competitiveness of the matters of the state, for a high-speed, high-density operating characteristics of high-speed railway is high-speed train operation safety is a top priority, but high-speed train as a by the complex technical equipment composed, running in a complex environment, complete nonlinear dynamical systems with distribution of complex spatial and temporal displacement services, how to process high-speed train establish an effective model and implementation speed tracking control, to ensure high-speed train safety and smooth operation is particularly critical. 针对高速列车运行过程的建模，通常采用基于牵引计算和运行阻力经验模型的描述方法，但其无法完整刻画动车组复杂多变的动态行为；多模型方法可部分解决动车组运行过程建模问题，但在高速列车高速运行时如何在线平稳切换模型仍缺乏有效策略。  For the modeling of the high speed train, usually described methods traction calculations and operation experience Model resistance based on, but not fully characterize the dynamic behavior of EMU complex; a multi-model method can be partially solved movable during vehicle group run modeling problems, but in the high-speed train running at high speed still lacks an effective strategy for how online smooth handover model. 针对列车运行过程，常用的控制方法有：（I)经典控制算法，主要是PID控制算法。 For the train is moving, commonly used control methods are: (I) the classical control algorithms, mainly PID control algorithm. 1968年，伦敦第一条盈利性投入运营的线路——维多利亚线就是运用了该算法，但是PID控制算法无自适应性能力，不能适应复杂控制过程。 In 1968, London's first line profitability put into operation - the Victoria line is to use the algorithm, but PID control algorithm without adaptive capabilities can not meet the complex control process. 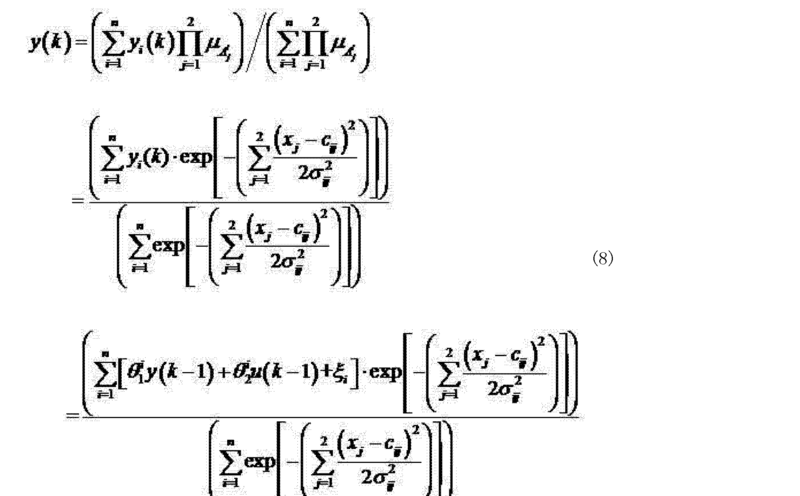 （2)智能控制算法。 (2) intelligent control algorithm. 有人提出采用模糊控制方法实现列车自动停车，取得了比PID更好的控制效果；（3)集成智能控制算法。 It was suggested by Fuzzy Control automatically stop the train, and achieved better than PID control effect; (3) integrated intelligent control algorithm. 有文献采用模糊神经网络控制实现列车运行过程跟踪，解决模糊控制规则数量多、相互冲突等问题；上述控制方法主要应用在城市轨道交通等普通速度列车，目前还没有应用在高速铁路上。 Has been a network fuzzy neural control realization train the process of tracking, solve the multi-fuzzy control rules number of conflicting issues; the control method is mainly used in urban rail transit and other common speed of the train, there is no use in high-speed railway. 本发明的目的是，对复杂的高速列车运行过程建立有效的自适应神经模糊推理系统（ANFIS)模型描述，基于列车运行过程ANFIS模型，通过预测输出速度和期望输出速度之间的偏差设计性能指标函数，采用广义预测控制方法，实现高速列车的高精度速度跟踪控制。  The object of the present invention is to establish efficient adaptive neuro-fuzzy inference system during high-speed train to run complex (ANFIS) model description, train process ANFIS model, passes between the predicted output speed and a desired output speed deviation design of the performance index, generalized predictive control methods to achieve high accuracy velocity speed train tracking control. 本发明的技术方案是：本发明根据采集的高速列车运行过程数据，利用数据驱动建模方法，建立高速列车运行过程ANFIS模型，采用减法聚类确定模糊模型规则数和初始参数，并采用反向传播算法和最小二乘法优化模糊模型参数；提出基于ANFIS模型的动车组运行速度预测跟踪控制方法，实现列车安全、高效、正点运行。  aspect of the present invention are: the present invention high-speed train operation during data collection, using data-driven modeling method of creating new ANFIS model speed train, subtractive cluster determining the fuzzy rule number model and the initial parameters, and using back propagation algorithm and least square optimization fuzzy model parameters; proposed EMU speed based ANFIS model predictive tracking control method, realized train safety, efficiency, punctuality. 其中&-是输入量和;前件参数&和<rf分别表示隶属函数的中心和宽度。 Wherein & - is input and; antecedent parameters & and <rf represent the center and width of the membership function. 3、对采集的样本数据进行减法聚类分析，得到最优模糊规则条数Il和初始模型前件参数\和％，并采用最小二乘法和反向传播算法对模型参数进行辨识优化，得到最优的高速列车运行过程ANFIS模型。 3, the sample data acquisition subtraction clustering analysis, the optimal number of fuzzy rules article Il and initial model front piece parameters \ and%, and the least square method and backpropagation model parameters identification optimized to give the most excellent high-speed operation process ANFIS model trains. 其中学习速率和^可以通过实验选择得到。 Wherein the learning rate and ^ can be selected by experiment. 时，性能指标函数Jr取得最小值。 , The performance index Jr made minimum. 式中,1:为(LfQL + Uf1MlQ的第一行。 Formula 1: is (LfQL + first row Uf1MlQ of. 综上所述，对于复杂的非线性高速列车运行过程，建立能以任意精度逼近任一闭子集实连续函数的ANFIS模型，提出基于ANFIS模型的广义预测控制，获得控制力实现高速列车速度跟踪控制，保证了乘客的安全和乘坐舒适性。  In summary, the nonlinear process high-speed trains run complex, establishing capable of Approximation for any ANFIS model a closed subset of a real continuous function proposed Generalized Predictive Control ANFIS model to obtain control high-speed train speed tracking control to ensure the safety and comfort of passengers. 本发明与现有技术比较的有益效果是，高速列车运行过程具有非线性动力学特征，且环境复杂多变，一般采用经验模型和多模型切换方法，难以建立精确稳定的控制模型，从而影响速度跟踪控制。  The present invention and the prior art comparison of the advantages that high-speed train operation process having a non-linear kinetics, and the complex and changing environment, the general empirical model and multi-model switching method, it is difficult to establish a precise and stable control model, thus affecting the speed of the tracking control. 本技术方案根据运行数据应用减法聚类获得最优模糊规则个数和初始参数，并采用反向传播算法和最小二乘法优化模型参数，在线精确辨识，充分利用现场数据，避免经验模型的单一性；建立的A NFIS模糊模型采用的是模型融合的理念，改进了多模型切换不稳定的缺点。 This aspect is obtained according to the operating data Subtraction Clustering optimal number of fuzzy rules and the initial parameters, and using the back propagation algorithm and least squares optimization of the model parameters, line accurate identification, full use of field data to avoid the singularity empirical model ; the establishment of a NFIS fuzzy model uses a concept model of integration, improved multi-model switching disadvantage of instability. 提出基于ANFIS模型的广义预测控制方法，多步预测，循环滚动，得到准确的控制量，从而改变了凭经验调节的盲目性，使高速列车运行速度精确跟踪目标曲线，解决了大滞后问题，实现列车正点、安全、有效运行，保证了乘客安全。 The generalized predictive control method ANFIS model-based, multi-step prediction, rolling cycle, accurate control of the amount, thereby changing the empirically conditioned blindness, the high-speed train speed accurately track the target curve, solved a big lag, achieve train punctuality, safe, efficient operation to ensure the safety of passengers. 本技术方案简单实用，可实现高速列车自动驾驶控制。 This technical solution is simple and practical, enabling high-speed automatic train operation control. 本发明适用于高速列车运行过程在线监测和自动控制。  The present invention is applicable to operation of the process line monitoring and automatic control of high-speed trains. 本发明实施选用京沪高铁线路的某CRH型动车组为实验验证对象，采集改动车组在某线路段的2000组速度、控制力数据，并以其中1200组数据作为建模数据样本，剩余800组数据作为检验数据。  The embodiment of the present invention selects a CRH EMU speed rail line for experimental verification object acquired change car group 2000 sets the speed of a line segment, control data, and to which 1200 sets of data as the modeling data samples The remaining 800 sets of data as test data. 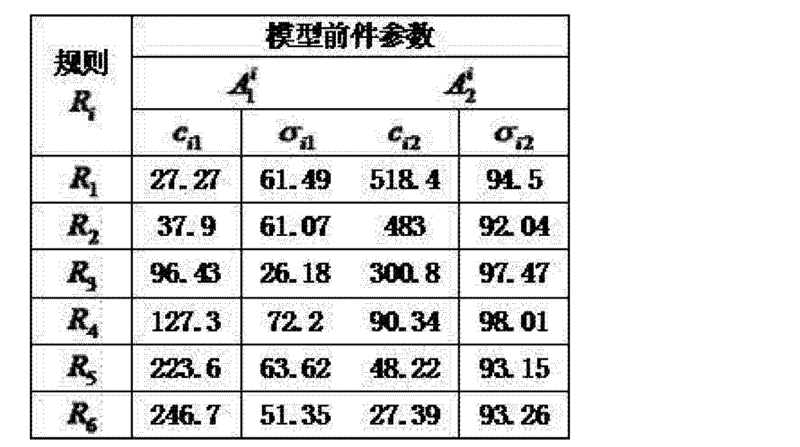 出误差分布曲线如图6。 An error distribution curve in Fig. 观察图6的模型验证过程,模型输出误差范围：-1.935 ~l._fcK/fc,满足CTCS-3列控系统的定位测速要求，即30fc«/ft以下30i»i/A以上不超过速度值的2%，表明所建立的ANFIS模型精度高，泛化能力强，有较好预测效果。 Observation FIG model validation, model output error range 6: -1.935 ~ l._fcK / fc, to meet the positioning velocity requirements CTCS-3 train control system, i.e., 30fc «/ ft or less 30i» i / A or more is not more than a speed value 2%, indicating that high ANFIS model accuracy established and strong generalization ability, a better prediction. 其次，控制器设计过程。  Next, the controller design. 基于上述模型，采用广义预测控制对CRH型动车组在京沪高铁线路的济南西站——徐州东站的实际运行速度进行跟踪控制，得到图7速度跟踪曲线和图8牵引力/制动力曲线。 Tracking control actual operating speed Xuzhou East station, to give 7 speed tracking curves and 8 traction / braking curve - the above model, the generalized predictive control to CRH EMU Jinan west station speed rail line based. 图7表明基于ANFIS模型的动车组速度跟踪控制方法在牵引、恒速、惰行、制动工况下均有良好的跟踪能力。  FIG. 7 shows that based on EMU speed ANFIS model good tracking ability tracking control method in traction, constant speed, coasting, braking conditions are. 保证了动车组的停靠准确性和安全性。 To ensure that the docking accuracy and security of EMU. 图8描述了动车组的单位控制力（牵引力/制动力）在整个运行过程缓和变化，过渡比较平滑，启动提速阶段变化较平稳，乘客舒适性指标得到一定程度的提高。 Figure 8 depicts the unit control of EMU (traction / braking force) to ease the change in the entire operation, the transition relatively smooth start changes in the acceleration phase more stable, passenger comfort indicators have improved to some extent. 1. 一种高速列车运行过程ANFIS建模和广义预测控制方法，其特征是，所述方法根据采集的高速列车运行过程数据，利用数据驱动建模方法，建立高速列车运行过程ANFIS模型，采用减法聚类确定模糊模型规则数和初始参数，并采用反向传播算法和最小二乘法优化模糊模型参数；提出基于ANFIS模型的动车组运行速度预测跟踪控制方法，实现列车安全、高效、正点运行。 1. A high speed train process ANFIS modeling and generalized predictive control method, wherein the method according to the high-speed train operation during data collection, using data-driven modeling method of creating new ANFIS model speed train, subtractive cluster determines the fuzzy number of rule model and the initial parameters, and using the back propagation algorithm and least square optimization fuzzy model parameters; proposed EMU speed based ANFIS model predictive tracking control method, realized train safety, efficiency, punctuality. 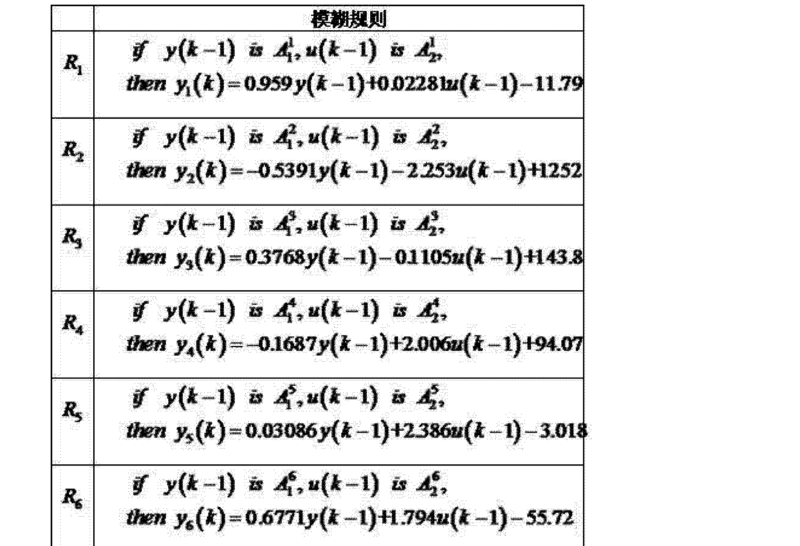 为控制加权系数，约束控制量。 To control the weighting coefficient constraint control amount. 4.根据权利要求1所述的高速列车运行过程ANFIS模型与广义预测控制方法，其特征是，所述基于ANFIS模型的动车组运行速度预测跟踪控制方法在整个控制过程将预测输出速度J与目标函数给出的期望输出速应_^之间的误差反馈给广义预测控制器，经过具体计算获得并输出控制量《，从而实现列车速度跟踪。 The high-speed train operation procedure ANFIS model and generalized predictive control method according to claim 1, characterized in that, the basis EMU speed ANFIS model predictive tracking control method of the overall control process outputs the predicted rate J and the target desired output speed function given should _ error between the ^ back to the generalized predictive controller, after the concrete obtained by calculation and outputs the control amount ", in order to achieve the train speed tracking.